There were static HTML websites which were the only option in the past by most of the people who were interested in getting websites for their business. The dynamic and robust websites that we see today with so many robust features have evolved with time. It has taken years for this transition to happen in the form of simple and static HTML websites to immersive and high-end dynamic websites with HTML to WordPress websites with the help of the professional developers that are available in the market and many professional WordPress development companies. Why past HTML websites needed a change at all? There was lengthy coding which led to styles and the scripts that were super slow as well as coded in HTML frameworks which were not fast at all! There was a strong need of the change to the super slow annoying websites for the businesses to fast and dynamic websites made with a dynamic website development platform that can take care of all the needs of a business and it’s growth. The reason was much known and all the web developers knew that the same code loads repeatedly on the HTML websites which contributes to the slower speed of the websites, unfortunately! Every page will slow down so it will not give the expected user-experience to the web visitors. There was a need to change the whole scenario and WordPress fulfilled that gap and space and it was embraced by the whole community with the open arms. You may think what was special in this blogging platform! Yes, it was initially just a blogging platform that facilitated the needs of the bloggers that wanted to reach to the maximum number of readers and audience. With time, this blogging platform developed to be the most popular website development platform. Thanks to some awesome features that it would impart to any website. It is much revolutionary as it has powered 29% of the total websites that are being run on the internet today! A business website should be built using such a platform that can help the entrepreneur to make changes as and when required. There were complex codes in HTML websites. Moreover, the websites built were not fast and great enough to impress the web visitors. A lot of pages is not reflective of a good website at all! It is very easy to create, modify as well as manage the website and WordPress users can do this easily. Another reason why you should opt for HTML to WordPress websites is that the dashboard of WordPress is so simple that it simply looks like a website with a a Menu. If you ever stumble upon any issues related to WordPress, you don’t need to worry at all! WordPress community is so big and vibrant that you get the answers to your queries almost instantly. There are so many themes and plugins that can be used in a website makes websites so unique. WordPress is quite popular for the feature that WordPress websites are completely SEO-friendly. It definitely means that audience will reach to your website more easily and you can reach for the target audience to grow your business to the highest infinite level possible. 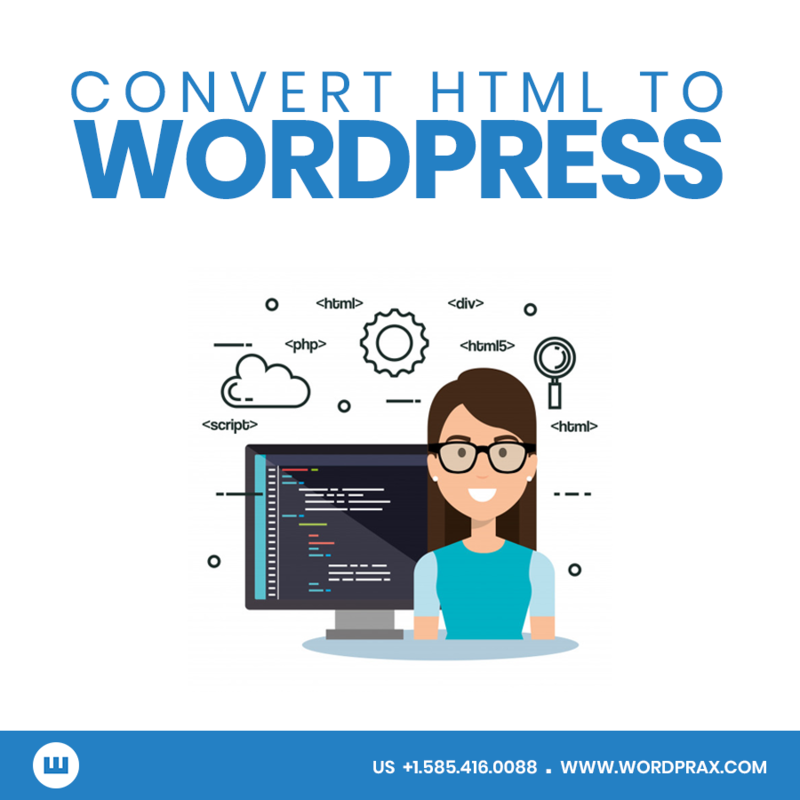 There is so much demand of the WordPress websites and HTML to WordPress conversion services that developers and website development companies are always there to cater to the unique requirements of every business. When you choose WordPress, you will never have to worry about the issues as there is a huge pool of certified developers to help you out there. Every business is so unique that it deserves a tailor-made website. With numerous WordPress themes and plugins, it is easy to create a website of choice. By customizing the themes, a great website can be created, by adding plugins, the functionality of the website can be extended! In this competitive environment, it is almost important that HTML to WordPress should be preferred to taste the success in business and to get a strong foothold in the digital industry. Category: html to wordpress, WordPress Developer, Wordpress Development and tagged HTML to Wordpress, wordpress developer, WordPress development by The WordPrax Editorial.